My sister-in-law Stacy's birthday coming up on the fourteenth of November. She’s a beautiful person both inside and out. Since I couldn’t find any “sister-in-law” works of art that satisfied the need to praise a beautiful person, I am resorting to a work by an artist who truly produced some of the most breathtaking paintings I’ve ever seen. Even his studies for paintings have an extraordinary beauty to them. And, I can’t think of a better way to pay tribute to my sis-in-law than with beauty in a painting equal to her beauty as a human being. As you may already be aware from my posts about Monet paintings, he is one of my inspirations for wanting (trying) to paint landscapes. I think the fact that he was growing as an artist and expanding his vision of what he wanted to show in paintings even in his eighties, should be an inspiration to any painter to keep at it. I often think studies like this have an abstract potential that eventually came to dominate his late water lily paintings. In 1890, Monet bought his home in the village of Giverny, which is now world-famous for his water lily garden. Nearby was the town of Port-Villez—between Vernon and Bonnières-sur-Seine—where he did numerous paintings as studies of reflections in water. To paint scenes such as this, Monet used a flat-bottom boat, something he had learned from the realist Charles Daubigny (1817–1878). In the 1860s, Daubigny was one of the Barbizon painters who encouraged Monet—and his fellow fledgling Impressionists—to paint landscapes outdoors to achieve realistic interpretations of light and atmosphere. This, combined with Monet’s encounter with the works of J.M.W. Turner (1775–1851), the great British Romantic landscape painter, is what started Monet on his path to true greatness. Like many of the Impressionists, Monet did not paint most of his works completely outdoors. He established the colors and light while outdoors, then refined the works in the studio. However, I have a funny feeling that this study was executed completely outdoors. It’s always thrilling for me, an aspiring landscape painter, to see sections of a Monet canvas unpainted. 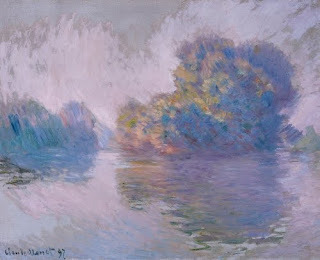 Monet’s brush work seems to follow the rays of light from the rising sun. Those arcing lines of color are echoed in the foliage to indicate the receding and jutting volumes of the trees. For Monet, the landscape did not exist separately from the surrounding atmosphere and light. He attributed those elements as the truly important contributors to a successful painted landscape.